Episode 74 - Rediate Tekeste, MA. Dan Sterenchuk and Tommy Estlund are honored to have as our guest, Rediate Tekeste, MA. 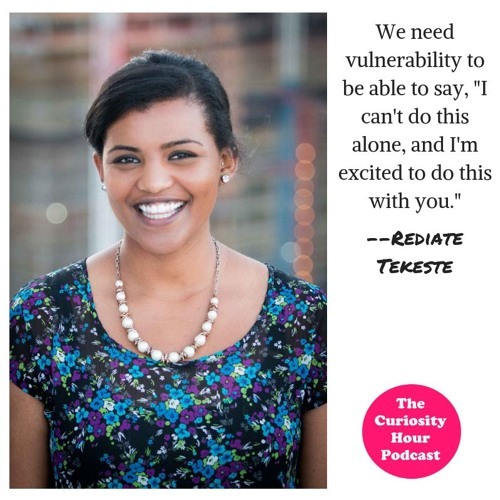 Rediate Tekeste is a 1.5 generation Ethiopian-American. Growing up in Iowa as an Ethiopian (kinda) immigrant, Code-Shifting became her Mother Tongue. She uses this ability in her career to build bridges between: Ethiopian young professionals and Ethiopia as the Founder of Ethiopian Diaspora Fellowship, big ideas and strategic plans as a Strategist for Integrate Africa and Redbird Group, and radical conservatives and snowflake liberals on social media (more of a social experiment than a job). She thrives in the weird (uncertain) space between a big idea and the final product. Rediate has worked for social action organizations including the Clinton Initiative, America Reads Program leading education efforts through community partnerships in low-income areas. In Ethiopia, she worked for World Vision Ethiopia as a journalist, and then built the communication department at Selam Children’s Village. Rediate discovered her passion for social impact media while working as an international Field Producer/Production Coordinator for Girl Rising. She also completed an internship with the renowned Population Media Center. She received her B.A in Interpersonal and Intercultural Communications at Arizona State University and her Master of Communication Management degree at University of Southern California. Note: Guests create their own bio description for each episode. The Curiosity Hour Podcast is hosted and produced by Dan Sterenchuk and Tommy Estlund. Please visit our website for more information: thecuriosityhourpodcast.com Please visit this page for information where you can listen to our podcast: thecuriosityhourpodcast.com/listen/ If you would like to share your story or have a suggested guest, please complete the "Contact us" form: thecuriosityhourpodcast.com/contact-us/ Disclaimers: The Curiosity Hour Podcast may contain content not suitable for all audiences. Listener discretion advised. The views and opinions expressed by the guests on this podcast are solely those of the guest(s). These views and opinions do not necessarily represent those of The Curiosity Hour Podcast. This podcast may contain explicit language.